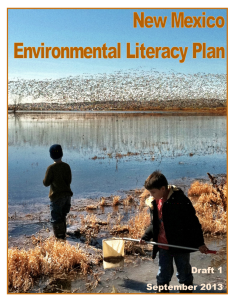 We had a great meeting, the Environmental Literacy Summit, on September 20 when we introduced the draft Environmental Literacy Plan and offered training in the Guidelines for Excellence in Environmental Education. Dr. Bora Simmons traveled from Oregon to provide the Guidelines training. We also had great presentations by Lesley Galyas, NM Public Education Dept. Director of the Math and Science Bureau, and our keynote speaker, Dr. Joseph Suina, a retired UNM professor and Tribal Elder at Cochiti Pueblo. After the plenary and the group presentations, we broke out into sessions dedicated to either learning more about how to teach environmental education while addressing the Common Core standards (Ms. Galyas), specific Guidelines for Excellence (Dr. Simmons), or offering critique of different sections of the plan (facilitated by volunteers). It was a rare opportunity to gather environmental educators to learn and share. The most common comment on the evaluation form was that we need more of this type of meeting. We will try to make that happen! We are accepting comments and ideas based on the first draft thorugh January 15, 2014. We have just received a small grant to visit several communities for targeted input from Native Americans and border communities. That may delay the writing of the second draft a few months, depending on how quickly the meetings can be arranged and whether things get waylaid by winter weather or holidays. Thank you for your support of the plan!